J. Org. Chem. 2018, 83 (21), 13507-13514, DOI: 10.1021/acs.joc.8b02449. We report the synthesis of a macrocyclic receptor containing two di-meso-phenylcalixpyrrole units linked by two triazole spacers. The 1,4-substitution of the 1,2,3-triazole spacers conveys different binding affinities to the two heteroditopic binding sites. 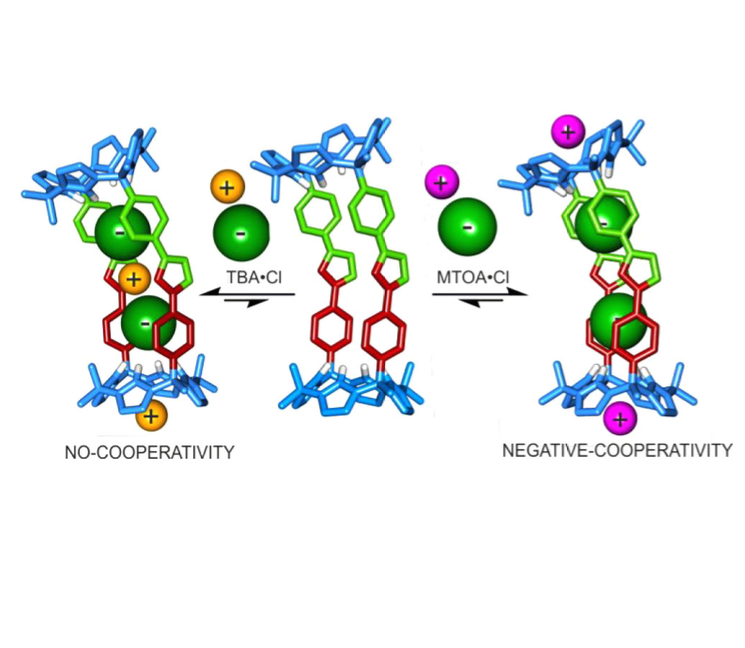 These features make the receptor an ideal candidate to investigate allosteric cooperativity in the binding of ion-pair dimers. We probed the interaction of tetraalkylammonium salts (TBA·Cl, TBA·OCN, and MTOA·Cl) with the tetra-heterotopic macrocyclic receptor in chloroform solution using 1H NMR spectroscopic titration experiments. The results obtained show that, at millimolar concentration, the addition of 2 equiv of the salt to the receptor’s solution induced the quantitative pairwise binding of the ion-pairs. The 2:1 (ion-pair:receptor) complexes feature different binding geometries and binding cooperativities depending on the nature of the alkylammonium cation. The binding geometries assigned to the complexes of the ion-pair dimers in solution are fully supported by X-ray diffraction analyses of single crystals. The thermodynamic features of the binding processes (separate or concomitant formation of 1:1 and 2:1 complexes), derived from isothermal titration calorimetry (ITC) experiments, are rationalized by combining the different ion-pair binding modes of the salt dimers with the dissimilar electronic properties of the two nearby heteroditopic binding sites of the receptor.